The Stand Up to Sectarianism e-resource was developed by Youth Scotland* with support from Nil by Mouth and Education Scotland as part of a pilot project. This online resource provides youth workers and teachers with the tools and information to design interactive sessions for the young people they work with. On behalf of the partnership consortium*, Youth Scotland is delighted to announce confirmation of Scottish Government funding to continue its community-based, grassroots approach to tackling sectarianism. Details of the small grants scheme and training dates will be announced soon. See the Youth Scotland website for more details. 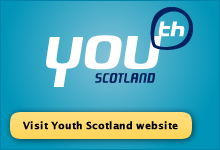 To receive regular Youth Scotland updates please sign up to our e-bulletin. *Stand Up to Sectarianism is a six-partner consortium comprising: Girlguiding Scotland, The Boys’ Brigade, The Girls’ Brigade , The Scout Association (Scottish Council), Clubs for Young People (Scotland) and Youth Scotland.